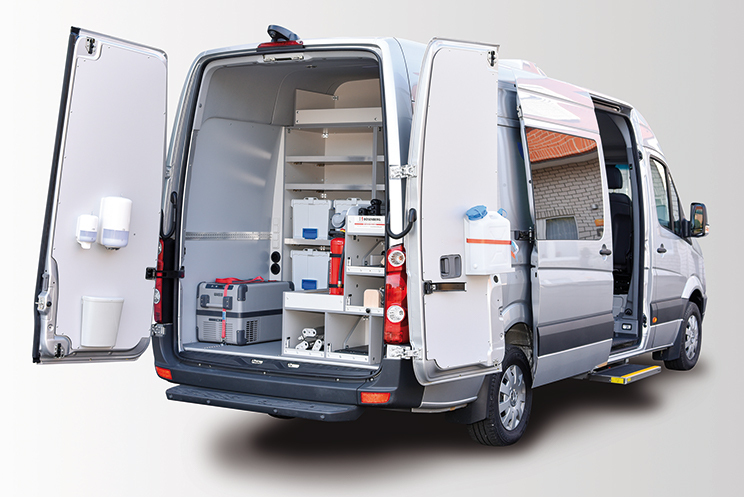 This vehicle combines a mobile workshop in the back and an office in the front. The sensitive instruments and tools it carries to measure vibrations and acoustic noise are worth hundreds of thousands of euros. To operate year-round the vehicle is also equipped with an air conditioner and auxiliary heater. In such a setup only the best of the best will do: a system built around two of Mastervolts biggest Mastervolt Lithium Ion batteries, the MLI Ultra 24/5000. These supply the energy for a Mass Combi Ultra inverter/charger combination and can also be charged through the vehicle’s engine, controlled by an Alpha Pro charge regulator. Eight-hour autonomy without running the engine. With the Alpha Pro regulator, the second alternator turns in to a 3-step+ battery charger for very fast and safe charging. Should the grid connection fail, the Mass Combi Ultra will take over within a minute, ensuring all AC loads continue operation uninterrupted. Compact lightweight fuse block, ideal for connecting 12 small 24 V loads suited for ATO/ATC fuses. DC Distribution 500 to distribute cables with higher (ANL) fuse rating. 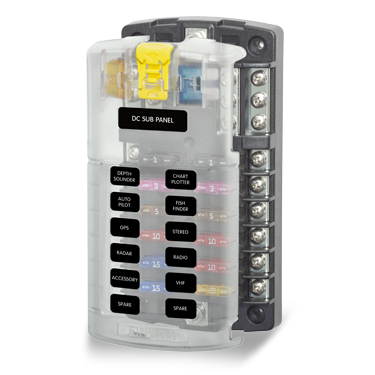 With two safety relays and two Class T fuses, the Li-ion system is redundant; operation can continue if one battery is disconnected. Space and weight saving is key for workshop vehicles. 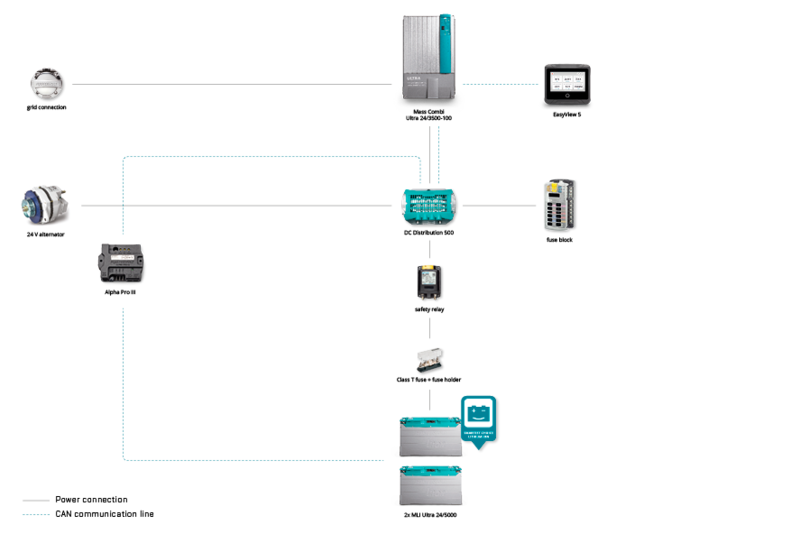 The electrical system was designed for long stationary, off-grid use to supply high currents continuously. Heavy electric consumers like air conditioning, compressor cooler and the auxiliary heating system can be fully operated for 12 hours via the two powerful Mastervolt Lithium Ion batteries with a total capacity of 10 kWh. The 24 V electrical system in a 12 V vehicle was chosen because of these high power demands. The entire system works perfectly in rough environment and climates with full output power in high or low ambient temperatures. This ST Blade Fuse Block for twelve circuits with negative bus bar and cover is very small, compact and lightweight, and suitable for up to twelve 24 V loads. It accepts ST Blade Fuses circuits up to 30 A with a maximum of 100 A per block. Proper safety by use of the cover, fuses are easy to access, and there is space for two spare fuses, and label recesses that accept Blue Sea Systems’ Small Format Labels for circuit identification.